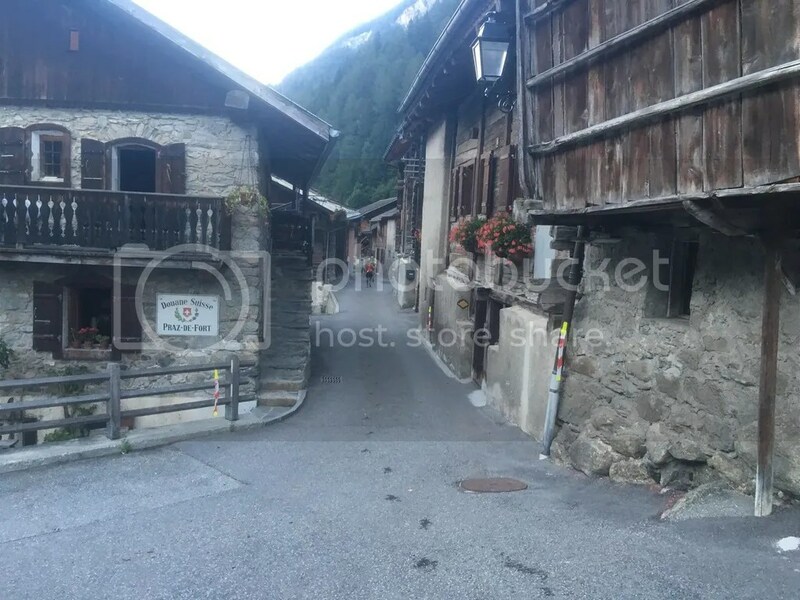 101 km & 20,000ft ascent starting in Italy, through Switzerland and finishing in France. Training went pretty well for this race which a rare occurrence nowadays haha! I had two build up weeks after taking some time off to heal properly. Then four big long run weeks to get most the training in followed by a little taper to stay fresh for race day. 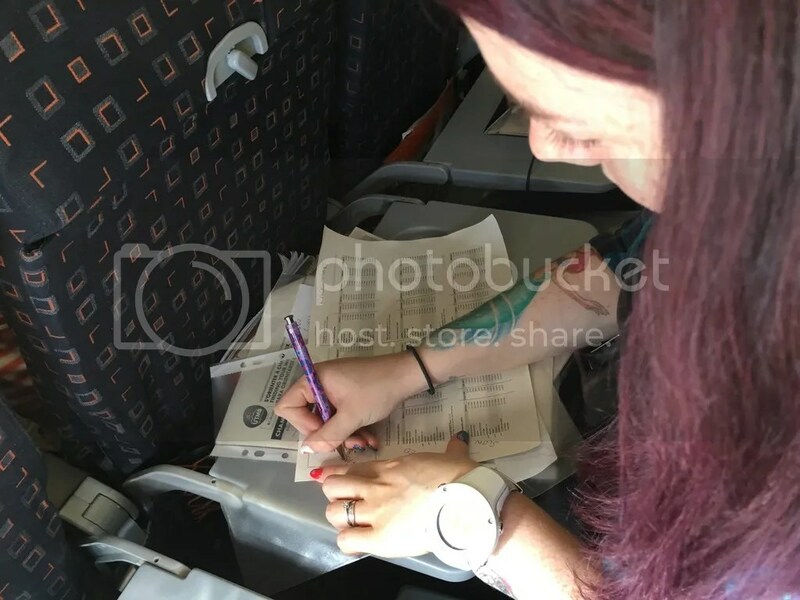 The training log is in my last blog post here. 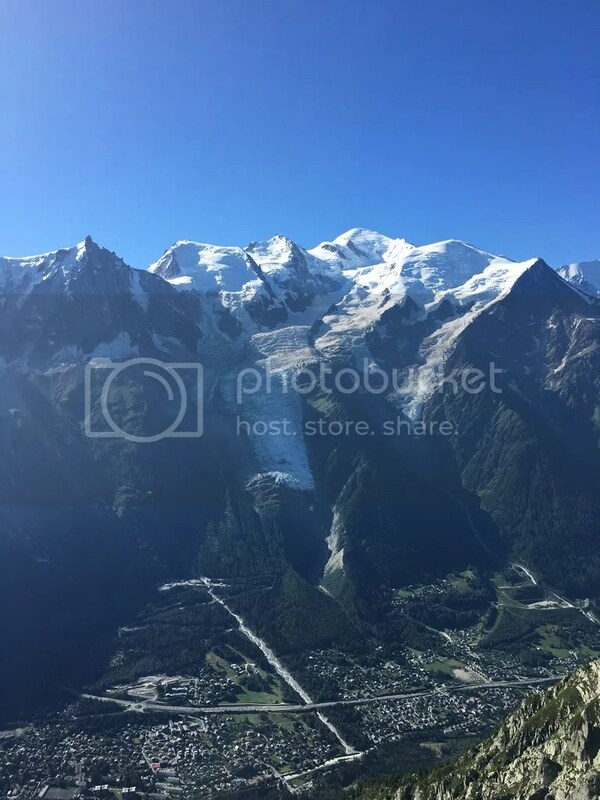 We flew out to Chamonix on Monday, this proved to be plenty of time before the race, I even think it was too much time because the nervous energy was becoming too much for me being around the buzz in town 24/7. Monday we explored the area, went to the race expo and bought some goodies. 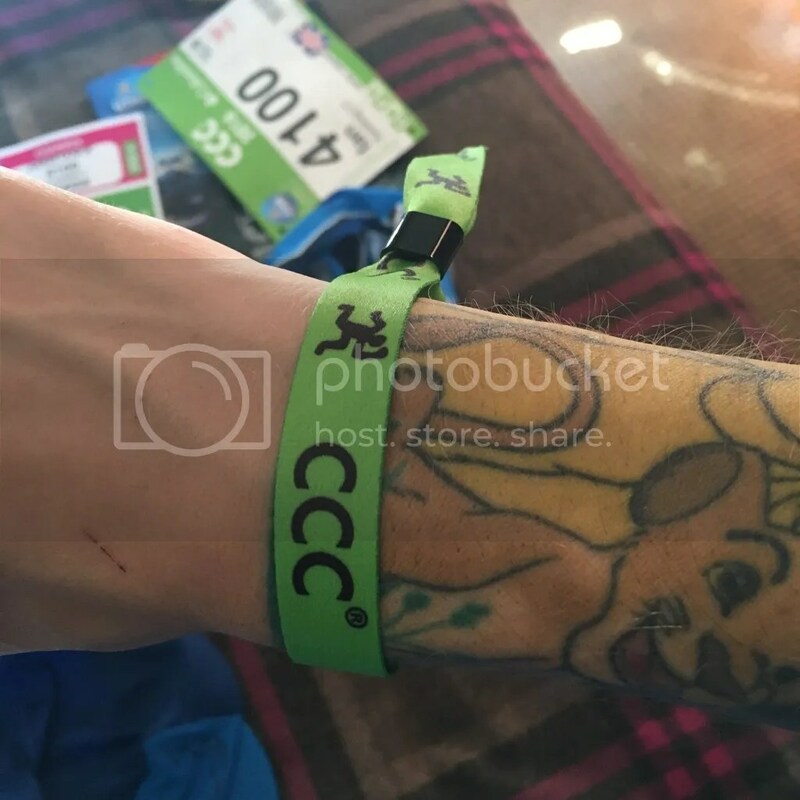 I even changed up my race kit by getting some white compression calf sleeves, and a cap I could dip and soak in water throughout the race because my trucker hat isn’t great for holding water. 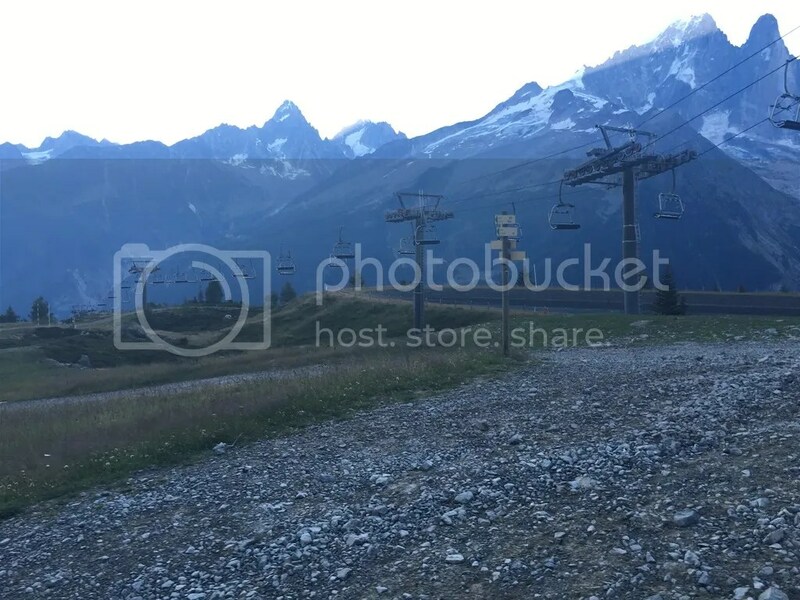 Tuesday we took the cable car up to La Brevent at 2525m to relax, get used to the altitude and eat our favourite food of the holiday – ICE CREAM!!!! Vicky was scared of the cable car because she’s not great with heights and it shook so much on the way up. 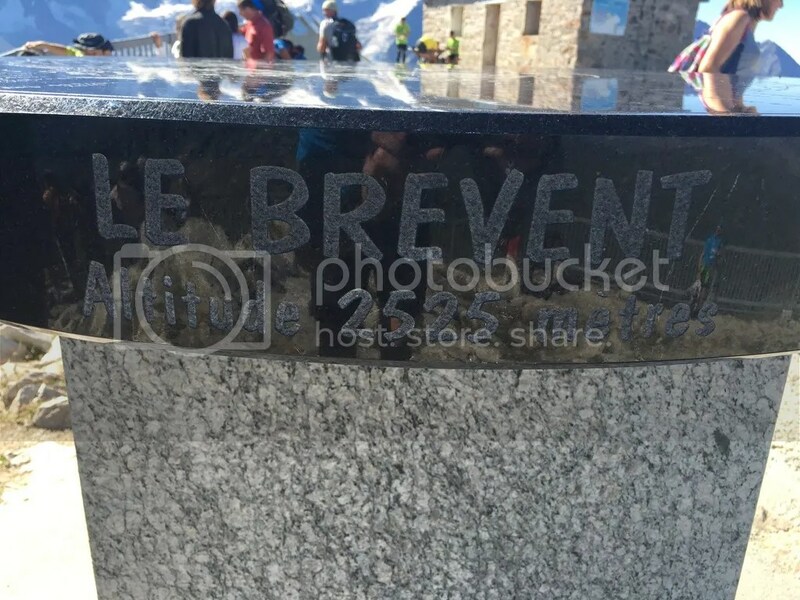 I did a little 2 mile run down from La Brevent to the ski lift, wanting to see how the legs felt. 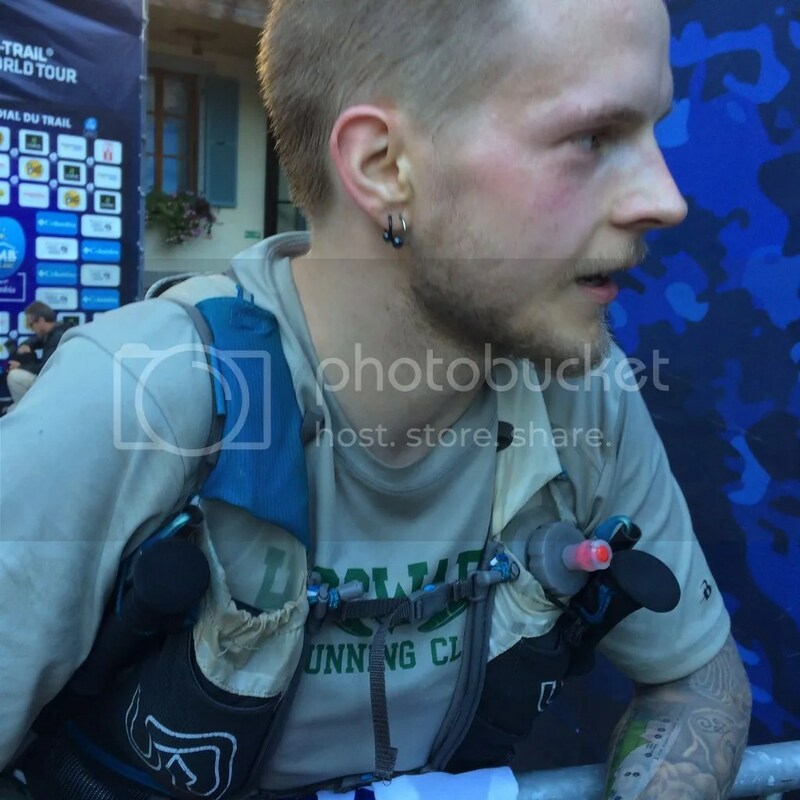 The temperature was pretty hot, this was my main worry going into the race, the altitude didn’t seem to effect me that much. 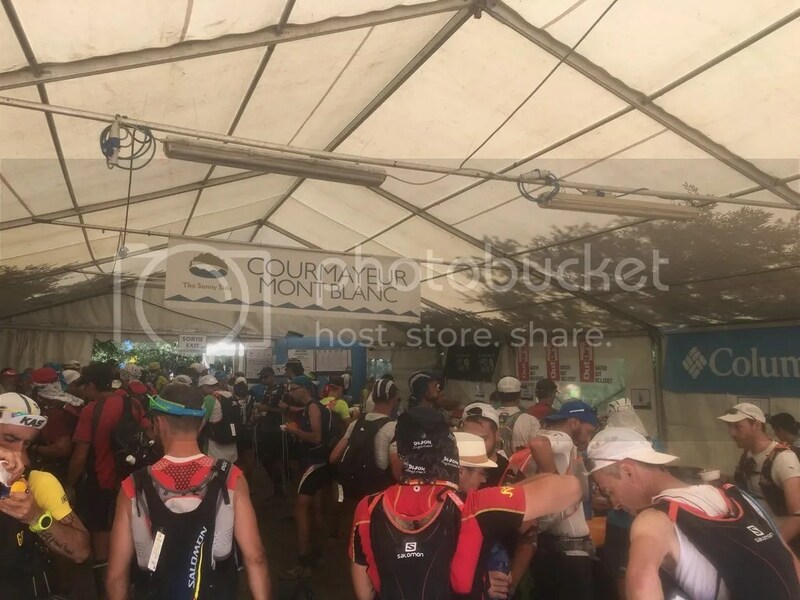 Due to the heat an email was sent out to carry extra water for the race, this was a good idea but I never ended up going into the back of my pack to get the spare water throughout the entire race. 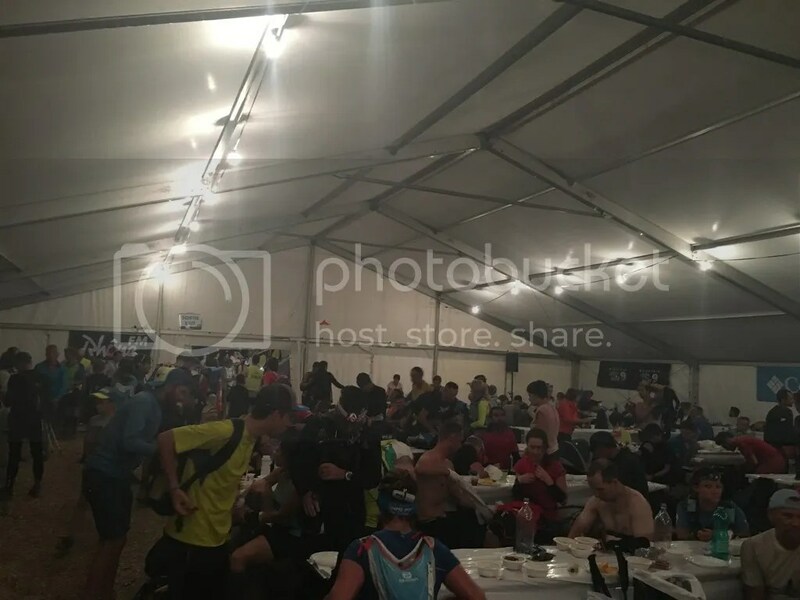 Race registration was really straight forward. I think the key point is getting there bang on opening for the race you are doing. 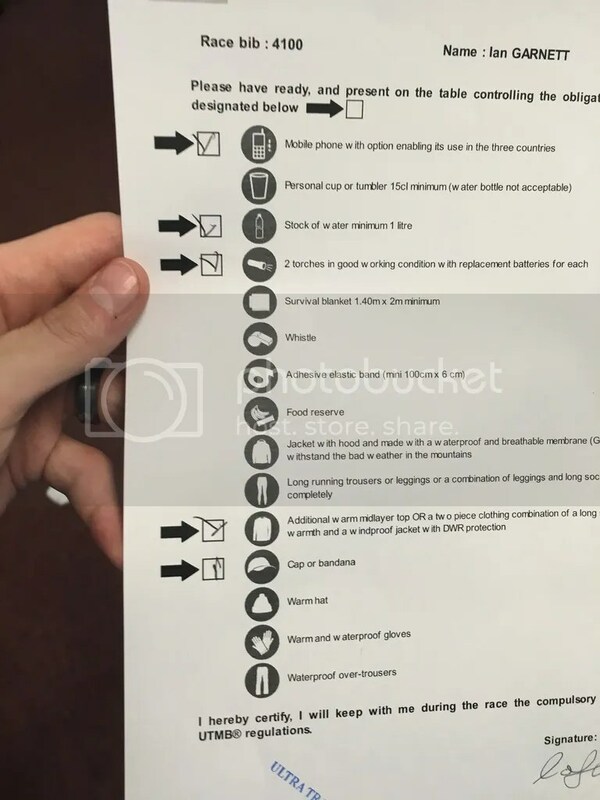 We stood in the queue for about 20 minutes before my passport was checked and a checklist was given to me to produce these random items on the list. 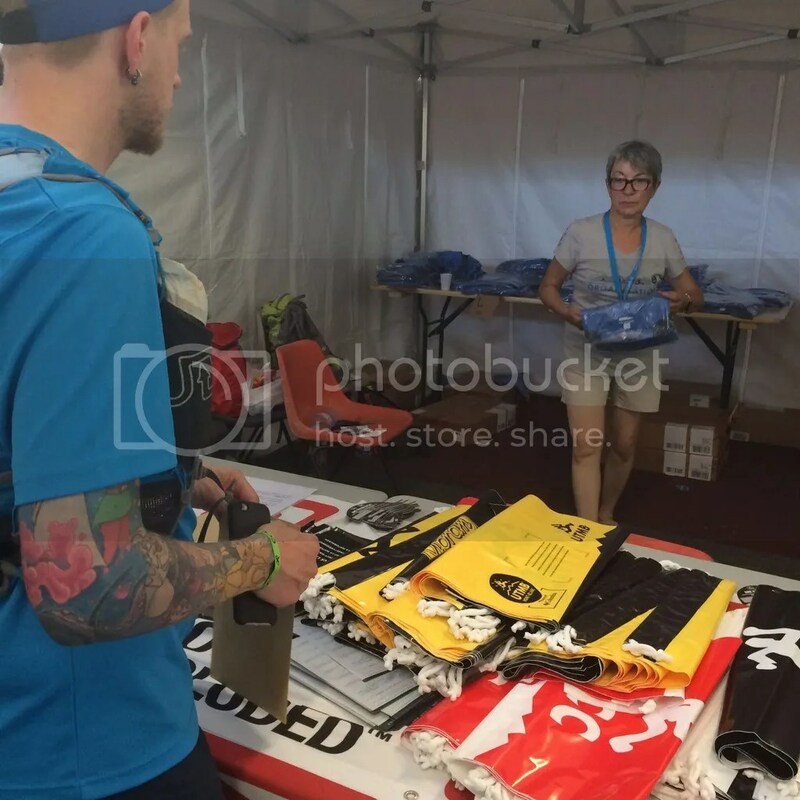 At kit check you pick up your bib, get a wristband on, get a bag with discount codes and the race T shirt – Which is fantastic quality! After another sleepless night in our hotel thanks to the idiots upstairs we were both pretty tired on race morning. 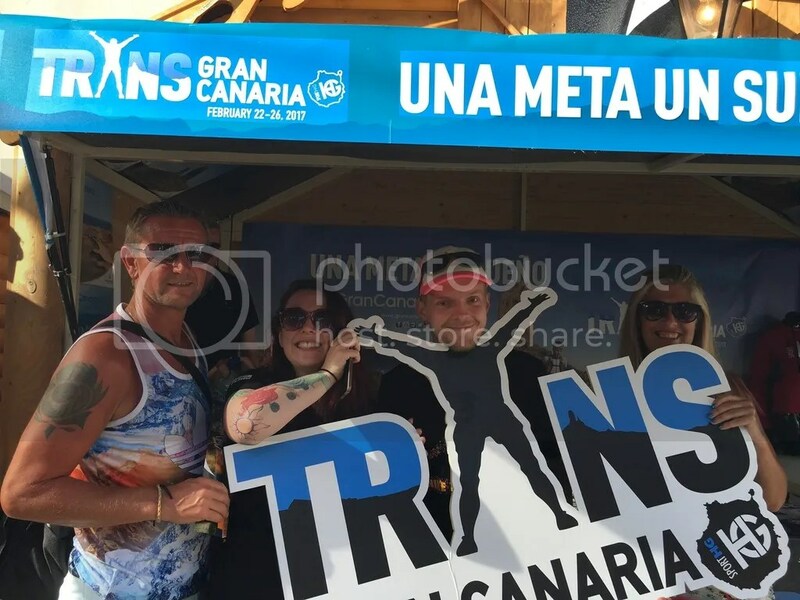 I booked us both on a pretty late bus to get to the race start, the bus departed at 7.15am but it was pretty much walk on with no queues, great organisation. 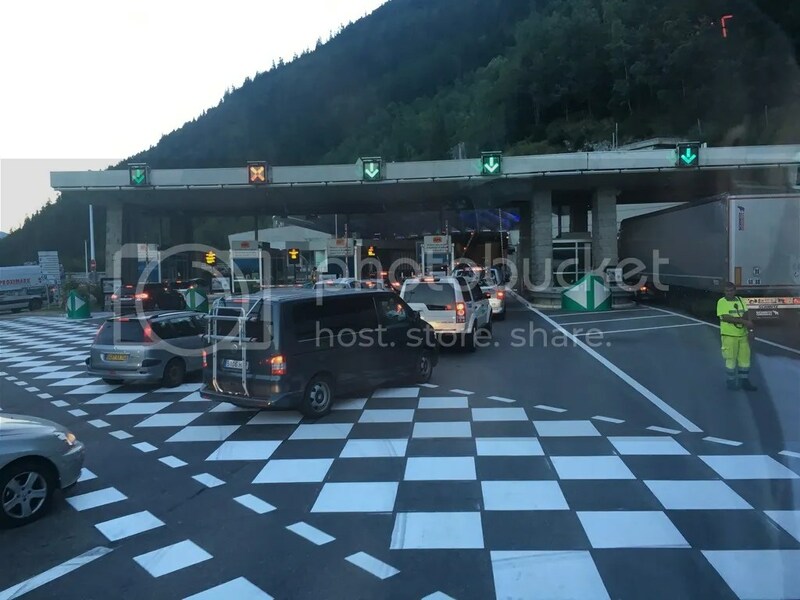 The bus went through the Mont Blanc tunnel and took around 45 minutes, after the bus I queued for the toilets at the drop off point to waste some time. 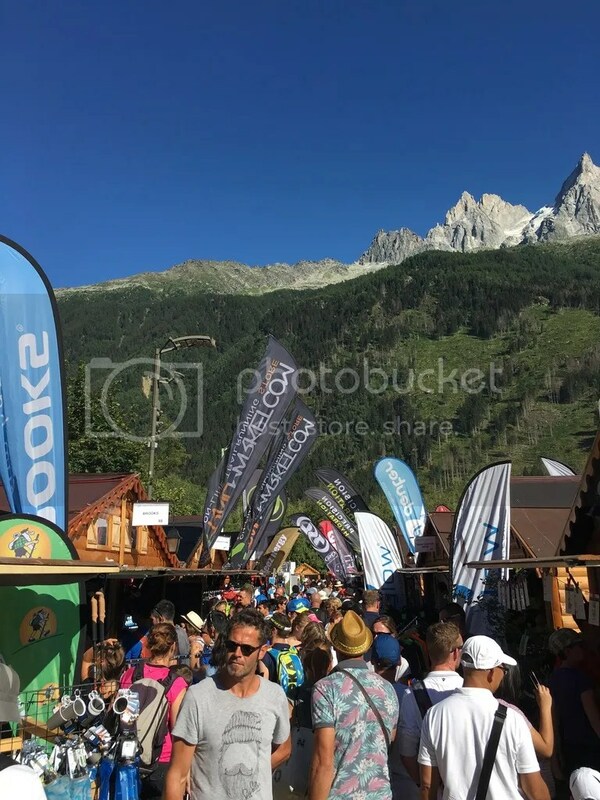 When we got into the little town of Courmayeur I scouted out some more toilets with a big queue, and decided it would be best to get in this queue to pass some time and get there before the start. 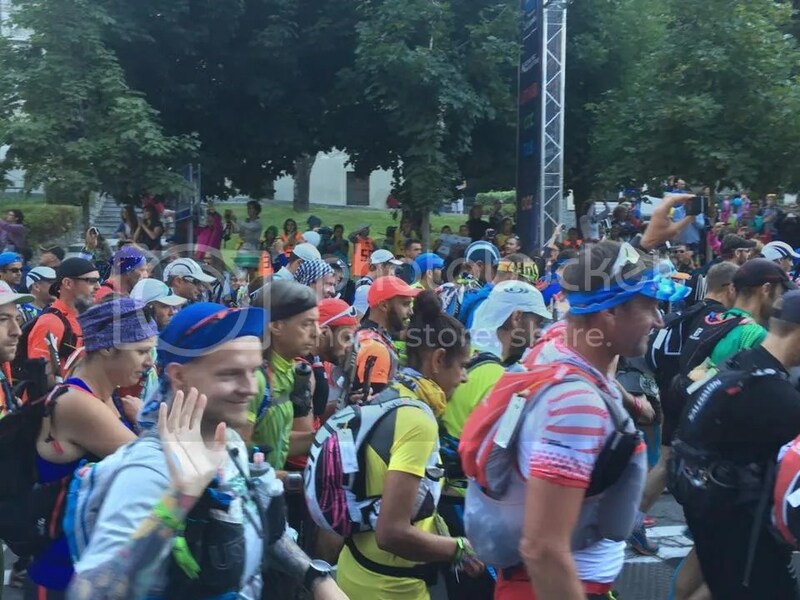 This plan worked really well and by the time I got to the front it was about 15/20 minutes before start – There was only THREE portoloos for the 2000 runners, sheesh! After the toilet I climbed the barrier and stood on the road, crammed in like sardines! I could see Alan over the other side of the road and Lynn on the pavement, but I was with Vicky at our side so stayed there for a while until they came over. First wave set off at 9.00am to the spine chilling epic music – Everybody in the pens must have had goosebumps at this point! 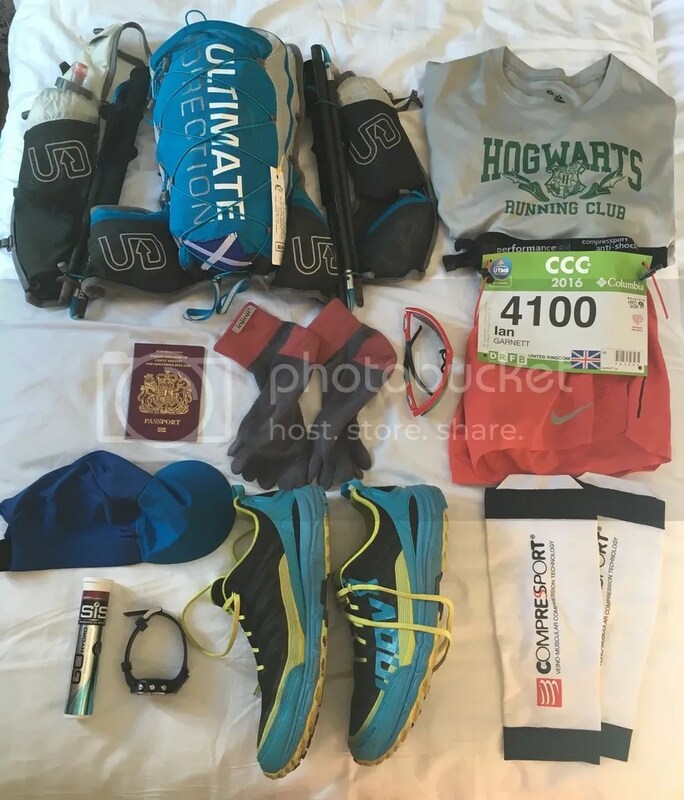 It seemed like forever until the second wave set off (my wave), and I don’t think I’ve ever been this nervous for a race, I wasn’t nervous about the distance, or the climbing, or the time it would take – I couldn’t care less about that during the moment. 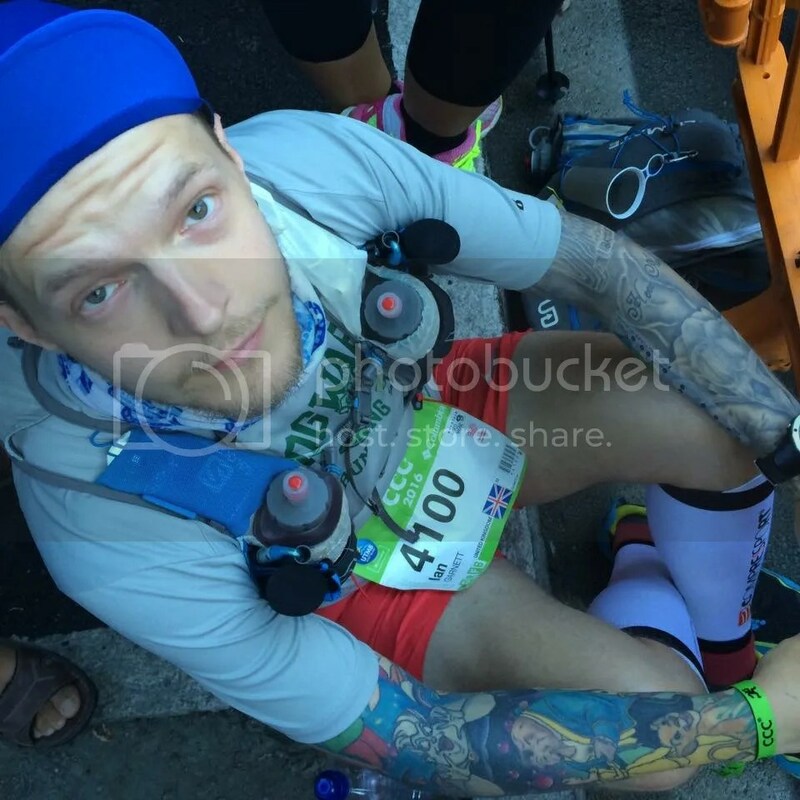 I was starting to panic about all the “What If’s”… What if I don’t finish this race, what would everyone think! I got myself really worked up at the start and probably didn’t enjoy the first few KM through town as much as I should have. 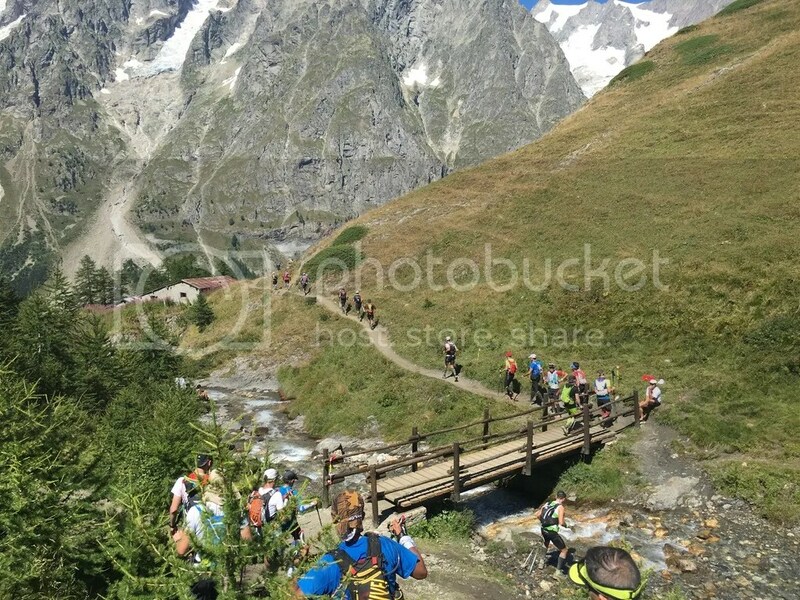 9.17am I set off with Alan through the super packed crowds, hearing the sound of a hundred cowbells! Those European sure love their cowbells haha. The race started to climb almost immediately and it was hard not to get sucked into a running pace here, knowing it would be best to relax into a stern walk and maintain that to save energy for later on. 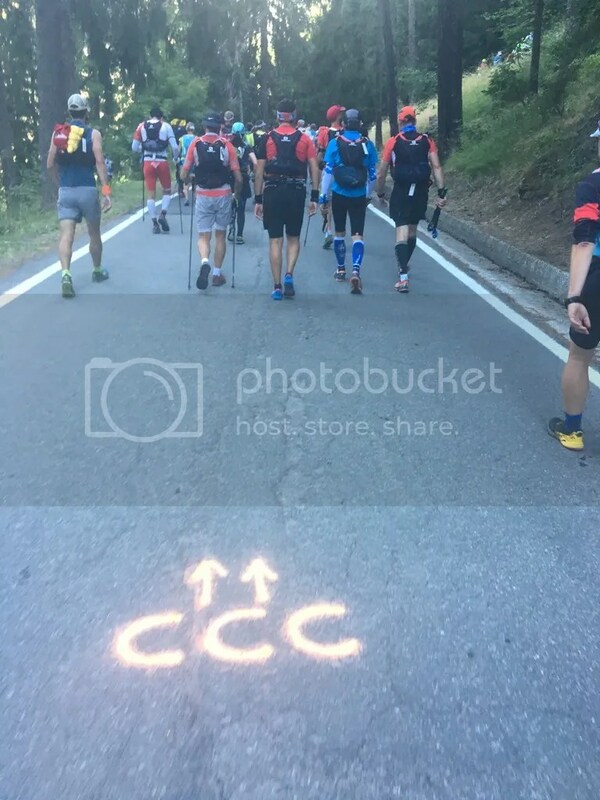 I was chatting to Alan on the way up, we had a few speedy people eager to pass at really silly places, almost rolling their ankles running off into the shrubbery just to gain a few places. The crowds were nowhere near as bad as expected here, no real traffic jams and no time did we stop for over a minute or so during the first hour. There was a few idiots who swung their poles back into your face, but it was easily avoided when you just tapped their poles with yours. 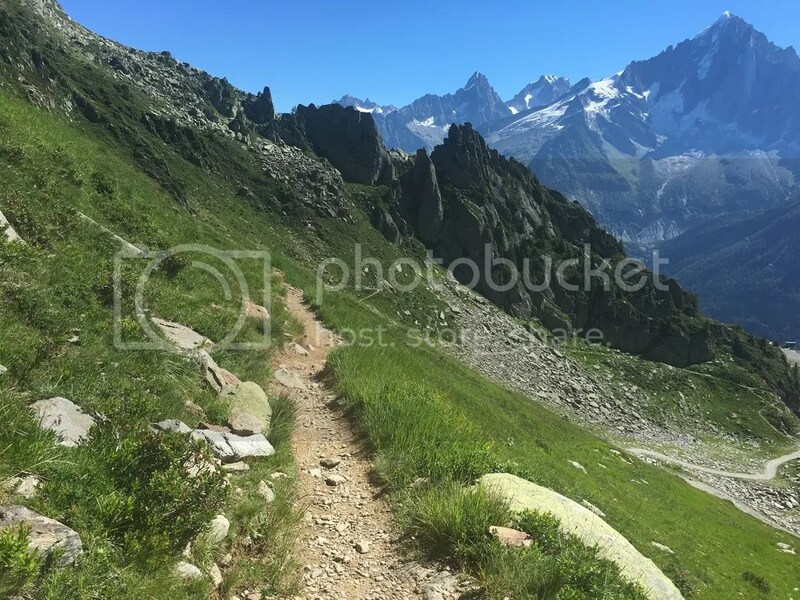 The climb up to Tete de la Tronche was brutal and took the best part of 3 hours!! 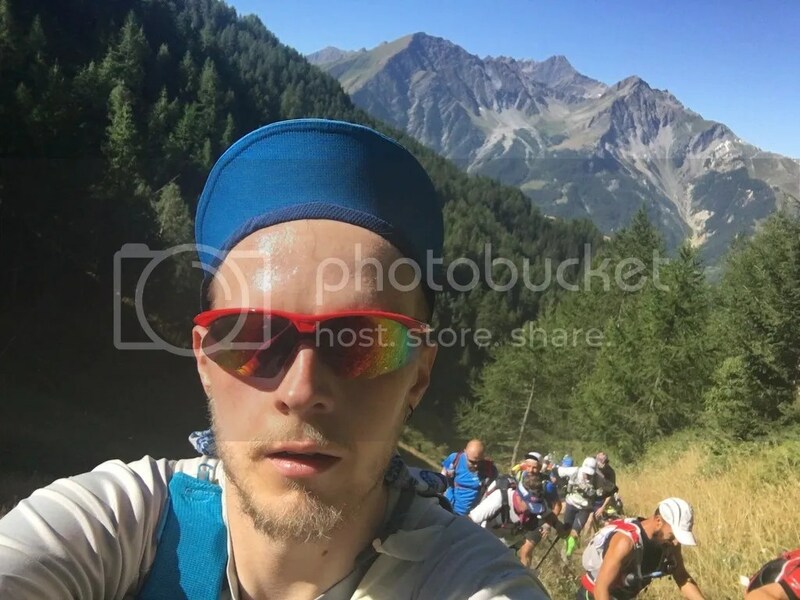 As soon as the route came out of the forest above Courmayeur the heat started taking its toll, it was absolutely roasting! Pretty much the story of the day from here on out. I’d say for a solid 2 hours out of the forest the sun was baking us. You can see the long trail of runners snaking up the mountain. Because it was the first climb it was best to just keep a steady pace and not push too hard. Once at the top the marshals were giving out water in limited supply. I just asked for them to fill up my wee cup for a mouthful. Next up was a nice 600m descent to Refuge Bertone where there was food and drink. This was the hardest descent for me during the race because my legs just felt like jelly. I kept scouting out places along the trail I could sit down and give my legs a rest but there was no shade so I just keep going. 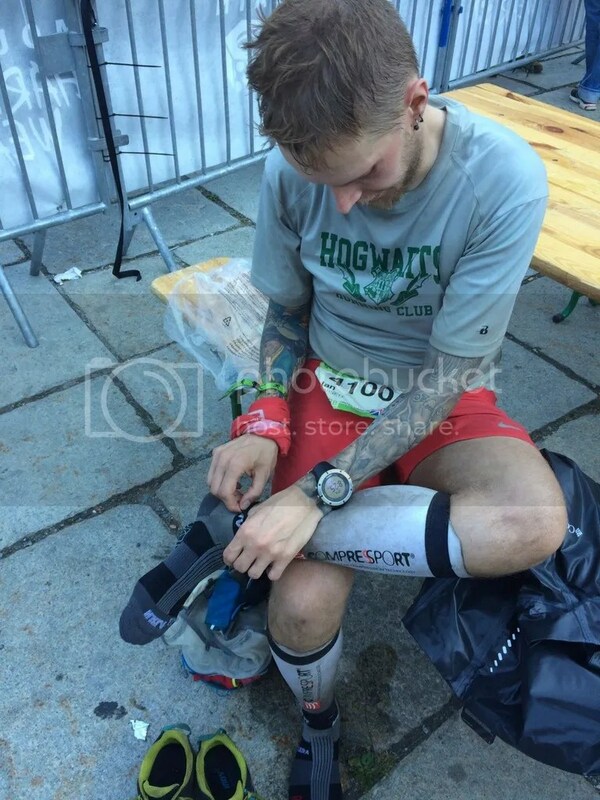 It was probably best not to sit down so early in the race but the climb had really taken a toll on my quads. At Refuge Bertone I immediately took my shoes off and put Vaseline on the hot spots, treating them as soon as I noticed so it didn’t become a problem. 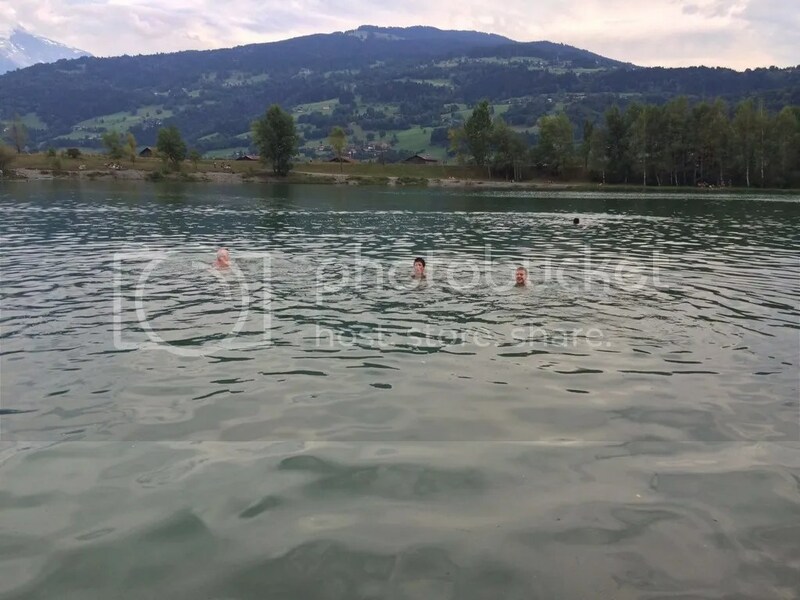 As we left the checkpoint, I spotted a nice river to cool down in. When i finally started to dip my buff and fill my bottles I fell in!! Falling onto the poles I thought I’d snapped them but luckily hadn’t! I was full soaked now but it was fine because of how hot it was our there. After getting some TUC biscuits, some energy bar and a few cups of coke it was time to head out with Alan. 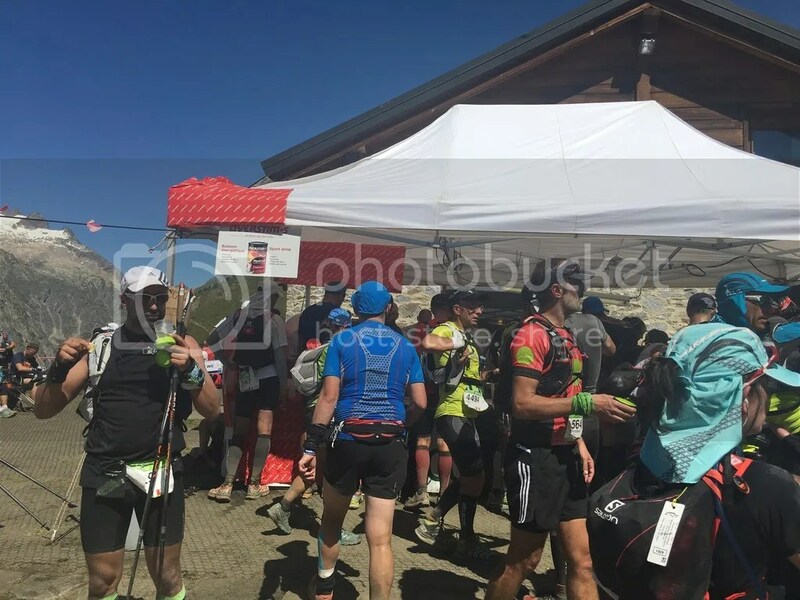 Pretty flat undulating section now to the next feed station Refuge Bonatti (still in Italy) – Is where I sampled the noodle broth: yummy! 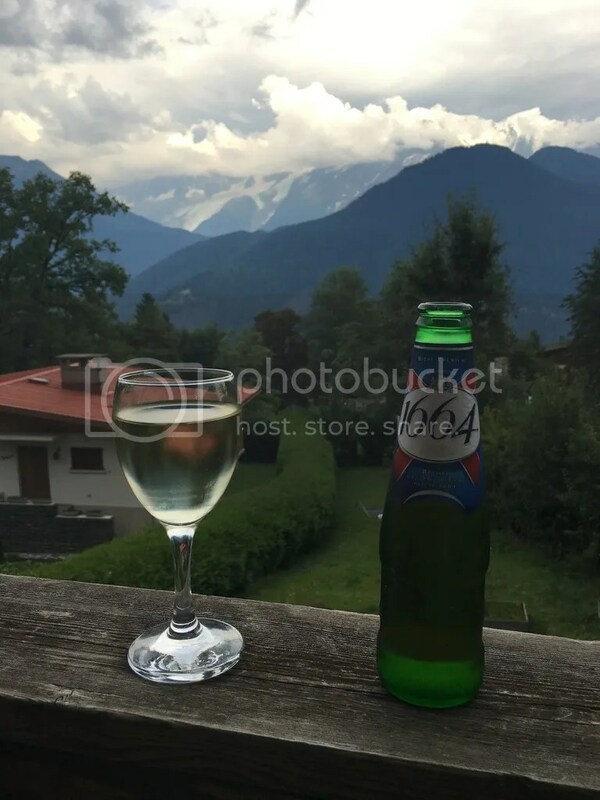 Refuge Bonatti offered some of the prettiest views of the Alps. 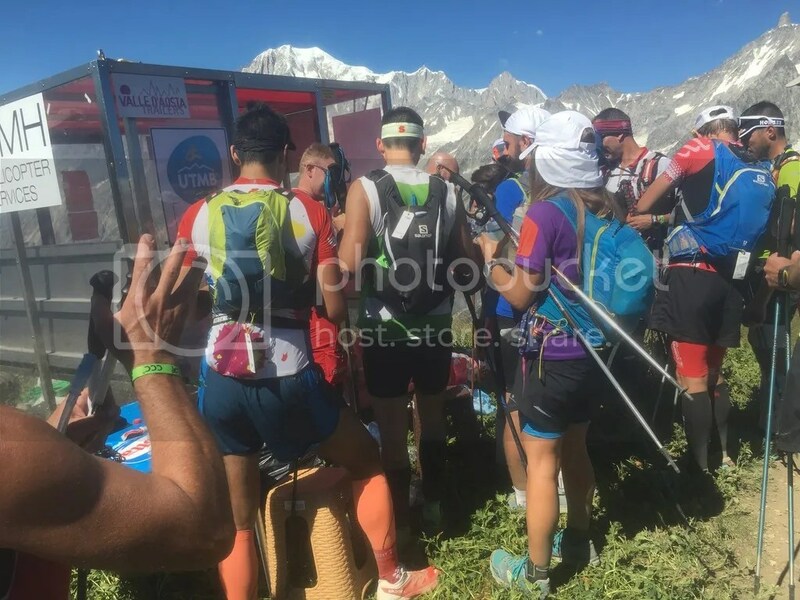 The first proper aid station came 27km into the race around the time we were crossing into Switzerland at ‘Arnouvaz’. This was a little tent which just circulated the heat! 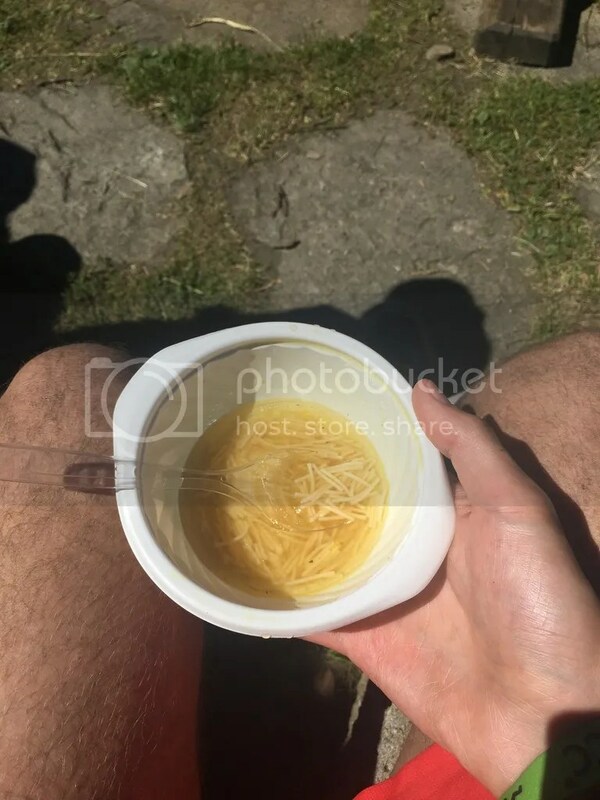 Again it was time for some more noodle broth, coke and some biscuits. Eating and drinking wasn’t an issue really, the main issue was the heat now. 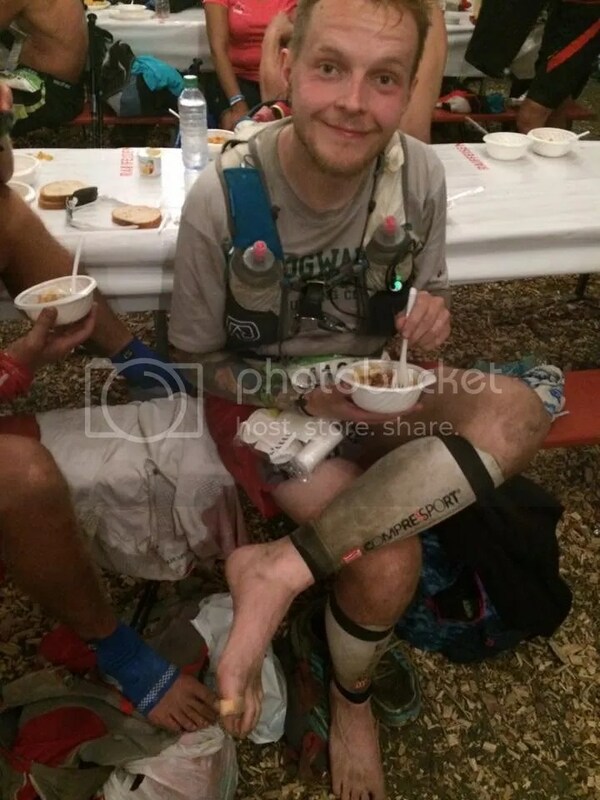 My feet were fine for now because of all the Vaseline, but I didn’t fancy getting them wet again if I could help it. 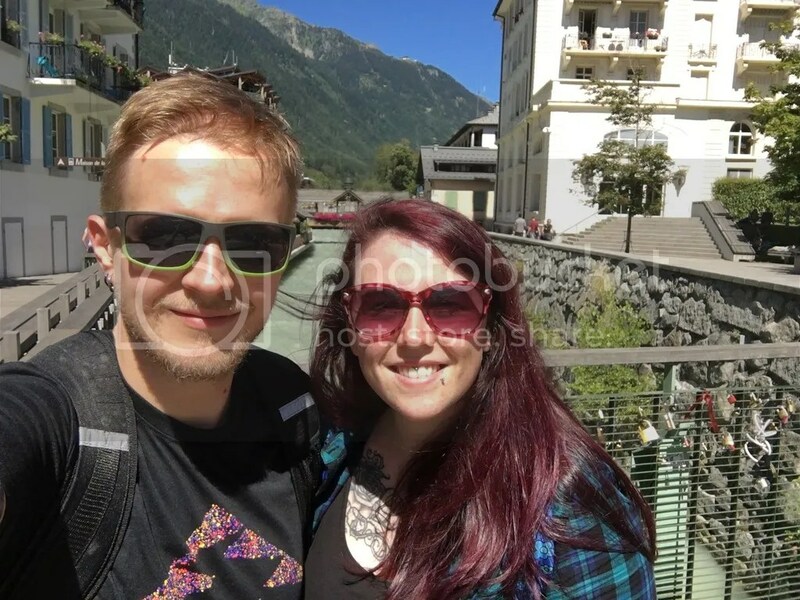 My choice of clothing was ideal to dip my hat and buff in every single stream we came across. 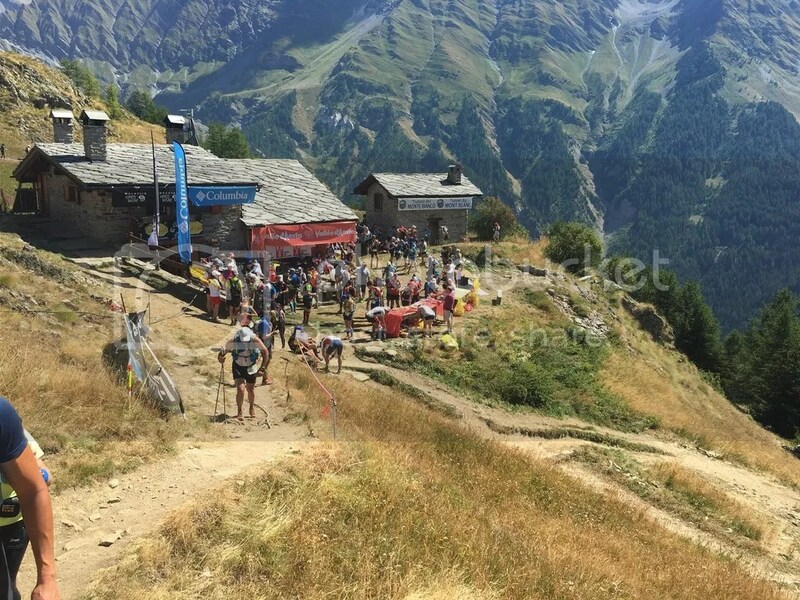 Next was the highest point in the race: Grand Col Ferret at 2537m and 31km into the race! This climb wasn’t as long as the first one because the route was already pretty high up, I got into a pace with Alan as we started to climb this behemoth in the sun. 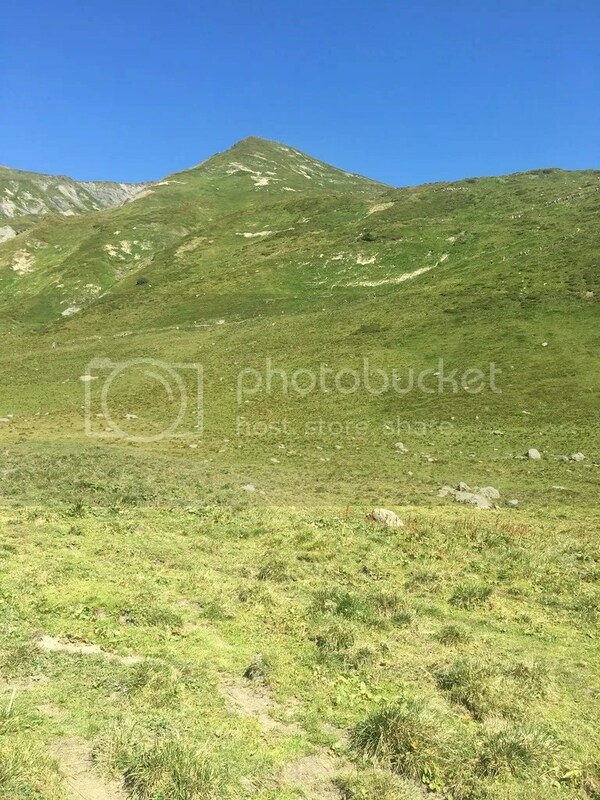 The cruel thing about the climb was you could see the top of it and it looked soooooooooooooooooooo far away all the time. I did sit down twice I think during this climb haha, the highlight was a trough near the top to refill the bottles and cool down. The descent from here was incredibly long but good fun! 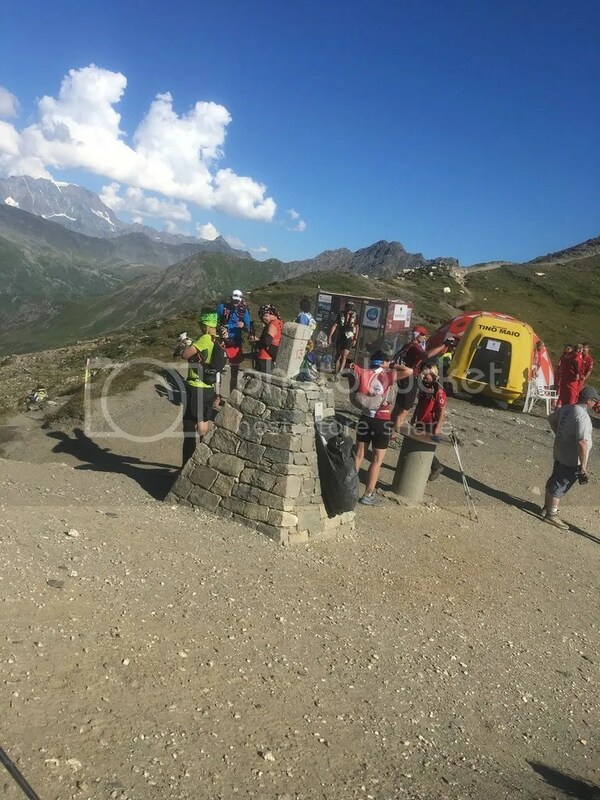 Halfway down there was a mini checkpoint with guys handing out water for us all, there was also a hose to cool down in too which was lovely! 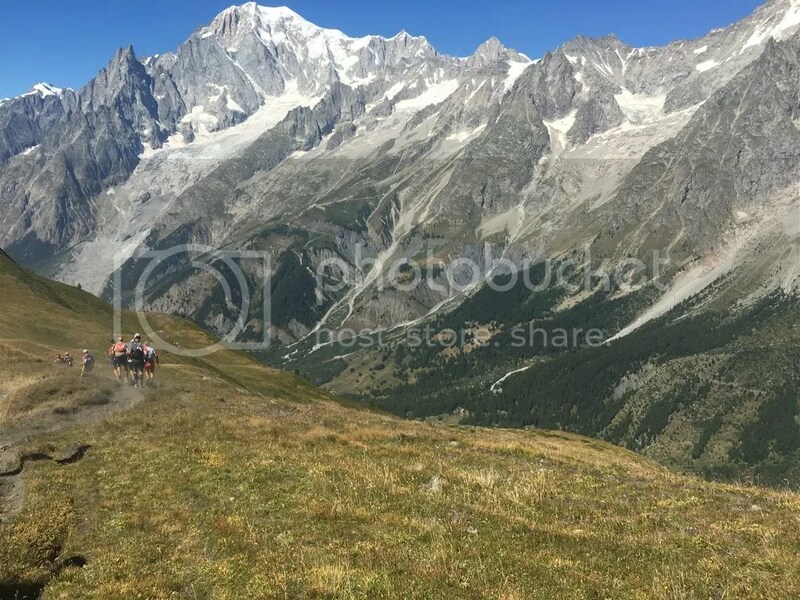 Another long descent before a major timing point and aid station was La Fouly. This checkpoint was great and the crowd support here was excellent, everyone was cheering the runners in. The food and drink here was great and I found a new love: Oranges! I must have fired through about 3 full oranges, they were really refreshing and great to quench the thirst. Refilled the water, took some food, put plasters on my feet and then lost Alan. I waited around a while, used the women’s bathroom because I think the guy had died in the mens? Then I shot off trying and catch Alan on the final part of the descent before the stiff climb to Champex Lac. 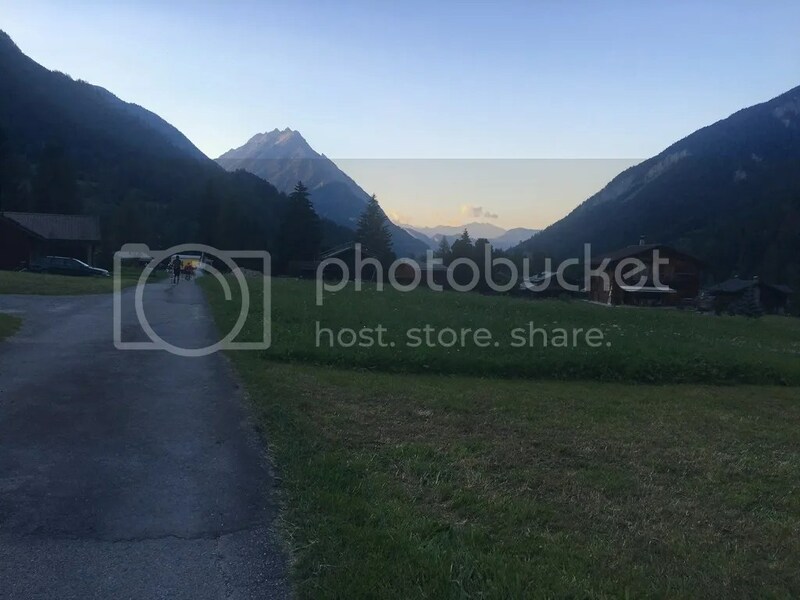 I caught Alan on the descent and we climbed into Champex Lac together, it was dusk now and the villages in Switzerland were truly stunning! The support in these villages was fantastic too seeing the whole family out offering drinks to runners. Champex Lac was huge! This is the first point where I met Vicky along the route, who acted as a support for a few of the Scottish runners who came through, along with her new friend Lynne who was supporting her husband Lachlan. Vicky met me and Alan in here, got us sorted with food and drink. I changed my socks here because my feet were still rubbing on the outside. It was dinner time so I had two little bowls of pasta and a few mouthfuls of soup. In hindsight I ate way too much here and made it really uncomfortable to run after this and the longest section without a checkpoint was coming up. It was 17km to Trient, with a huge climb and descent thrown in the middle. Running just made the food slosh around in my stomach so I never ate anything for the full section which took around 4 hours. It dark when we left Champex Lac so we had to don the headtorches (sorry no more photos). The climb out must have had about a hundred switchbacks, and the top was the little water stop with a bonfire where we sat for a few minutes having a break before a nice descent into Trient. Trient was like a bomb site! 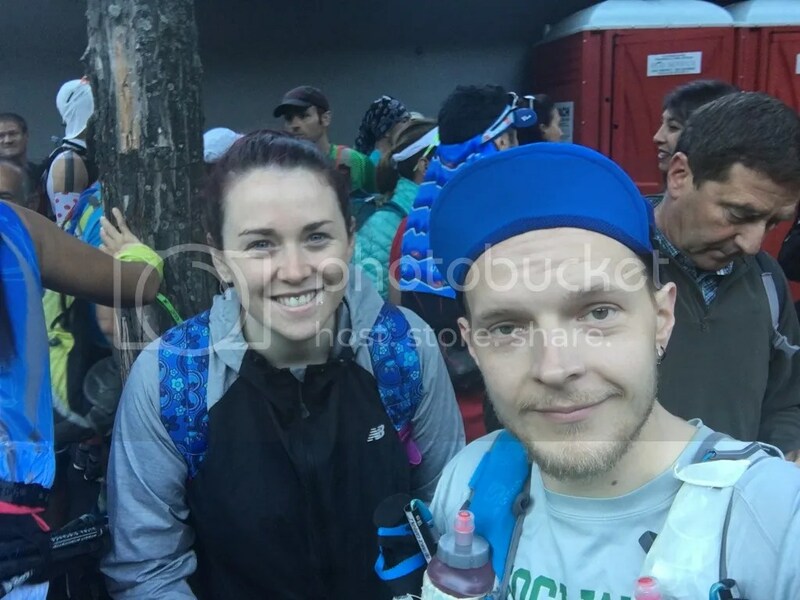 There was actually 2 ways to go into the aid station: turn left and head into the ‘Abandonment’ door or carry on into the Checkpoint. Once again, I ate some pasta here, got come coke, refilled my bottles and went on my merry way. Vicky was again a great help in Trient seeing we were okay and making sure we got watered and ready for another 11km section over the 2nd to last mountain. 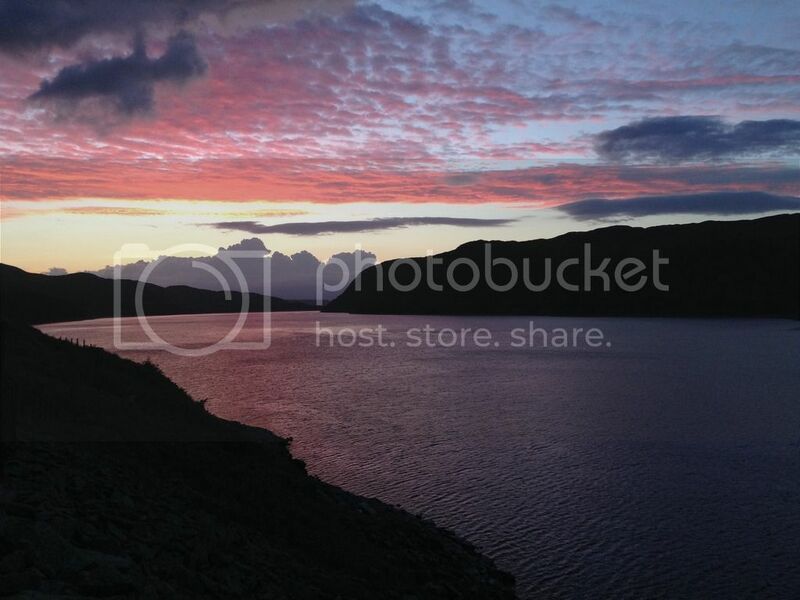 The climb up Catogne was long, hard work, dark and uneventful at the top. I think this was the climb with the little cattle grid thing you crossed then you started the descent. 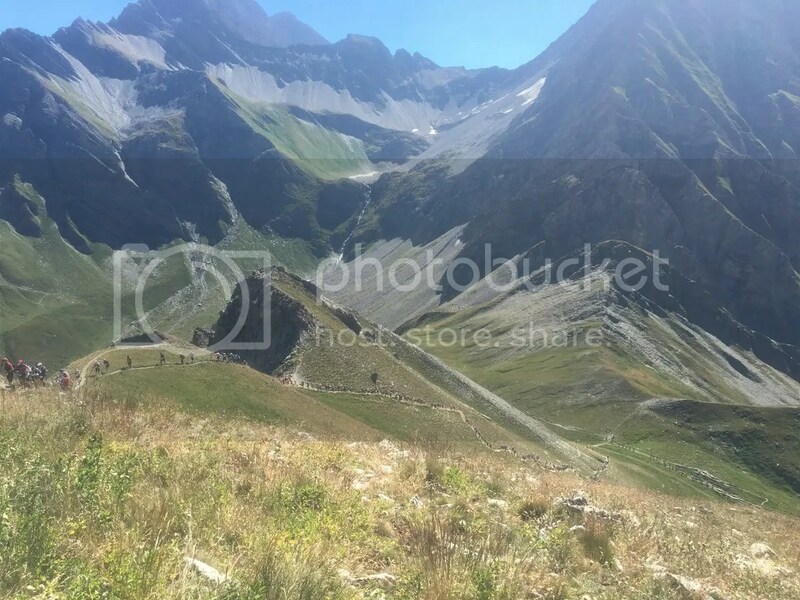 I remember this climb being one of endless switchbacks again, going up I was constantly looking for rocks to sit on and when you found an ideal rock it was already occupied – arghh!!! When we eventually found one there was big daddy long legs running around the place ew. Alan sat with me for a while and we chatted about rubbish in total darkness with our headtorches off. 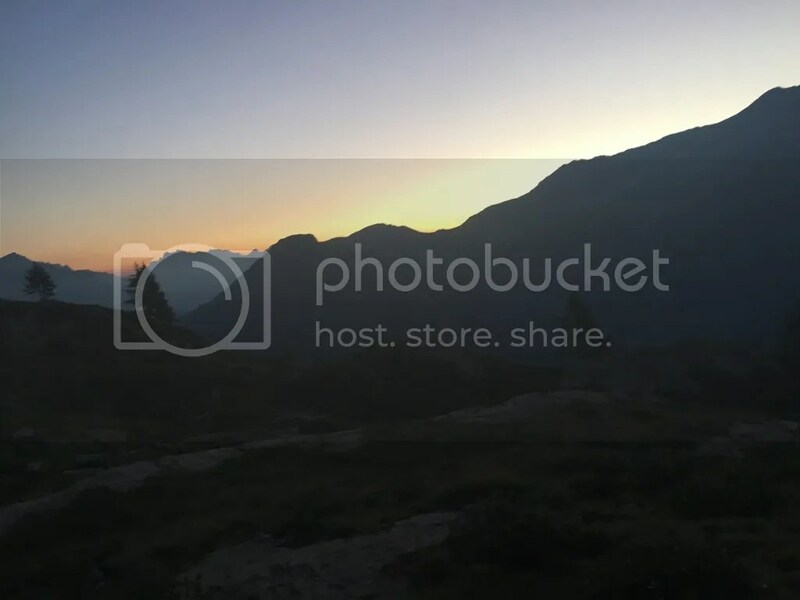 Now back in France and heading to the final proper checkpoint it was still dark and I was starting to get all panicked about not making 26 hours – My goal. 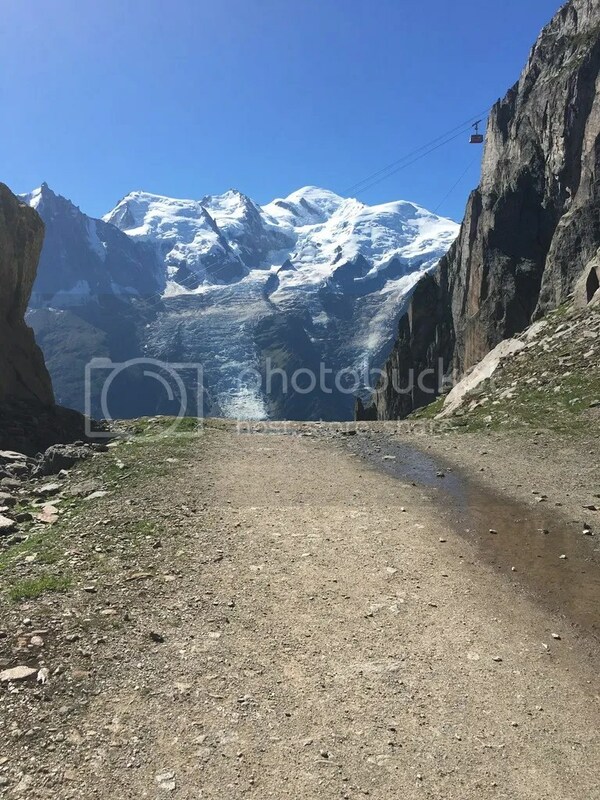 I mentioned this to Alan a few times and I think he was fine with us making 26 hours but I wasn’t having it, I got all flustered thinking about how big the final climb was and how the descent would be a killer into Chamonix. 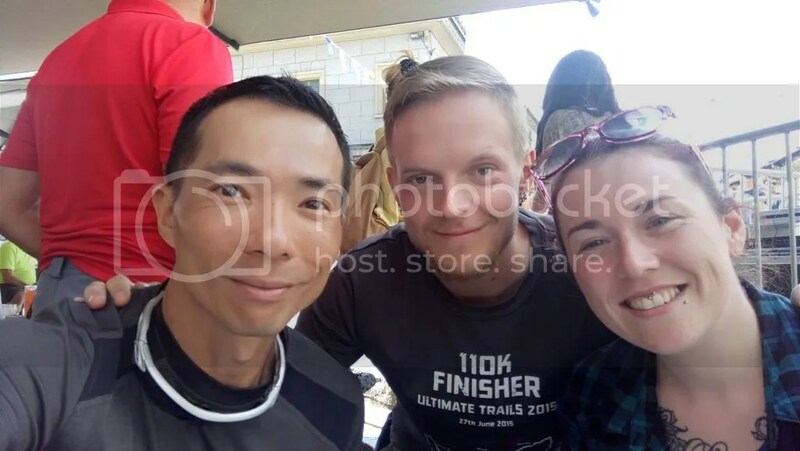 Vicky met us again here in Vallorcine (the checkpoint had a bar and everything)! I sat and ate food, Alan was looking pretty tired and I was all panicky so we must have looked a right state. We left the checkpoint and headed for what seemed ages to a light I thought was a timing point (it wasn’t), Alan had music playing and I kept walking at a quick pace without stopping, sorry Alan but I was determined at this point, something must have taken over the fatigue from the last climb. 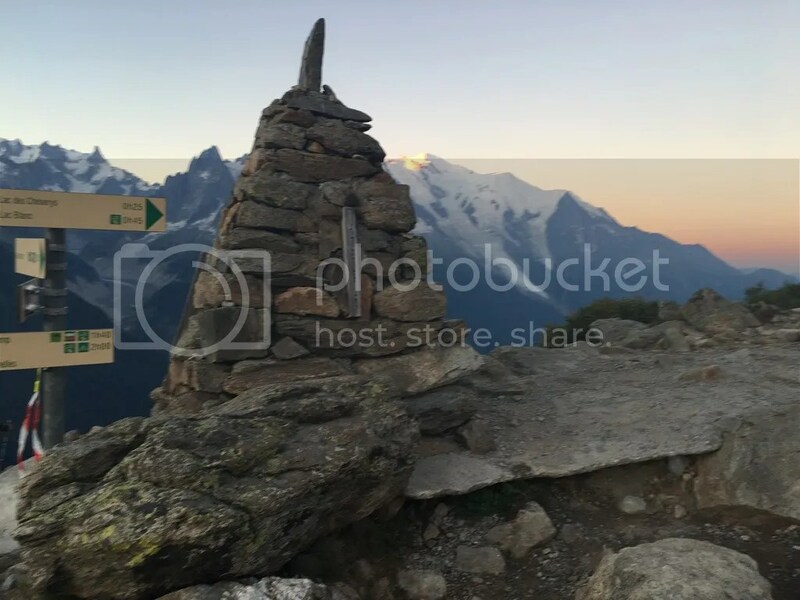 The climb wasn’t too bad, I got right behind a French man (Romain) and a Spaniard behind me, all 3 of us climbed up Tete aux vents in a little conga line, we didn’t stop once, I was pretty tired near the top and the rocks looked so inviting to sit on but didn’t bother now! It was best for me to keep the legs moving during this unforeseen second wind. 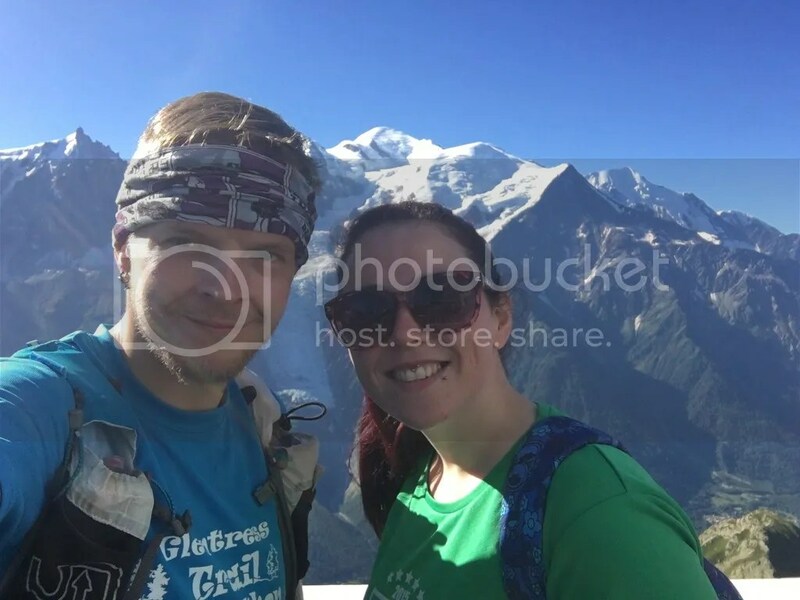 We had discussed how good it would feel once we hit the top and once we got there we all high fived and congratulated each other on a tough ascent! I had also packed my poles away ready for a descent where they were to follow me down, I ran on for about 2 minutes and naw, it kept going up!! What the hell?? Then again and again, Gavin was right about the false summits here. Man it was hard work! I felt like an idiot with my poles away but had to keep them tucked away pretending it wasn’t too hard with my hands on knees, didn’t want to face the embarrassment of getting my poles back out. At the top I got scanned by the marshals and ran down at quite a good pace. 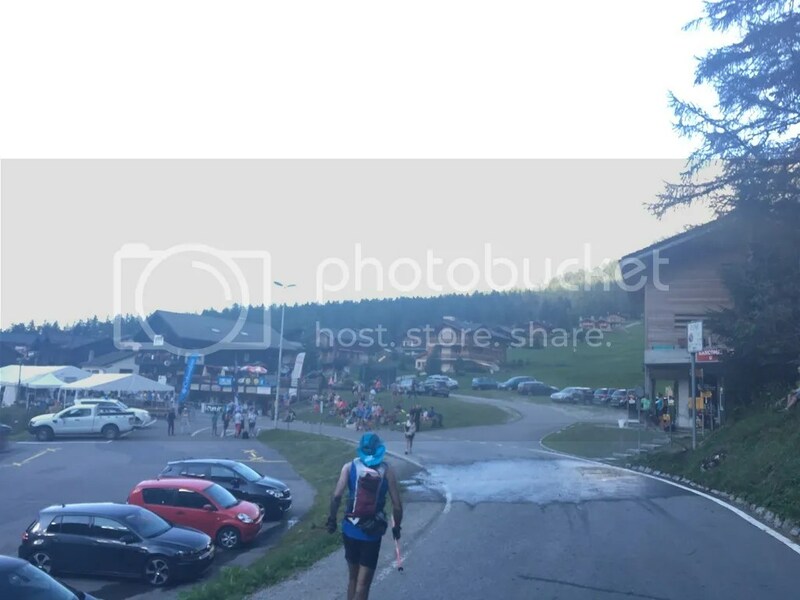 I could see the final checkpoint in the distance and kept up a good pace overtaking people as safely as possible and trying not to get stabbed with poles this late in the race. 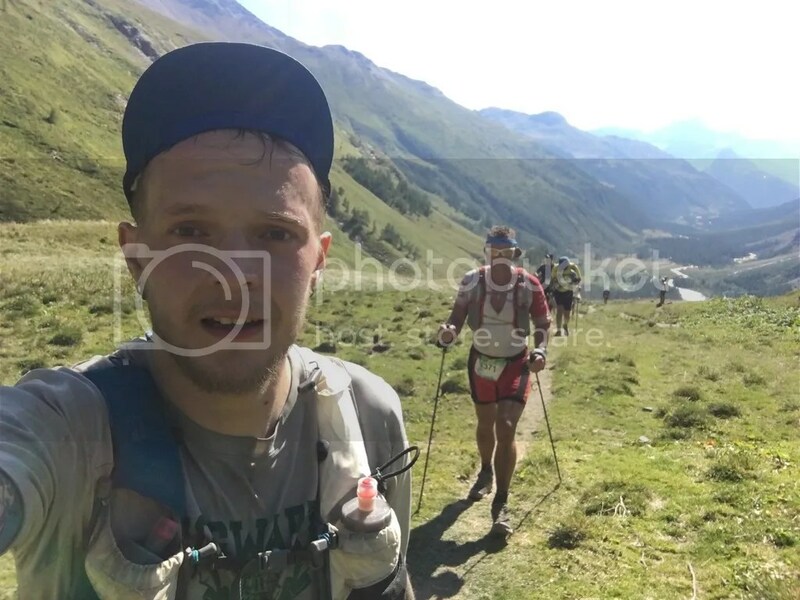 Approaching the checkpoint I was overcome with emotion, all the thoughts about the race came flooding back, including Vickys support, the messages of encouragement and I kept picturing the finish – So close! This was a real highlight of the race looking back. 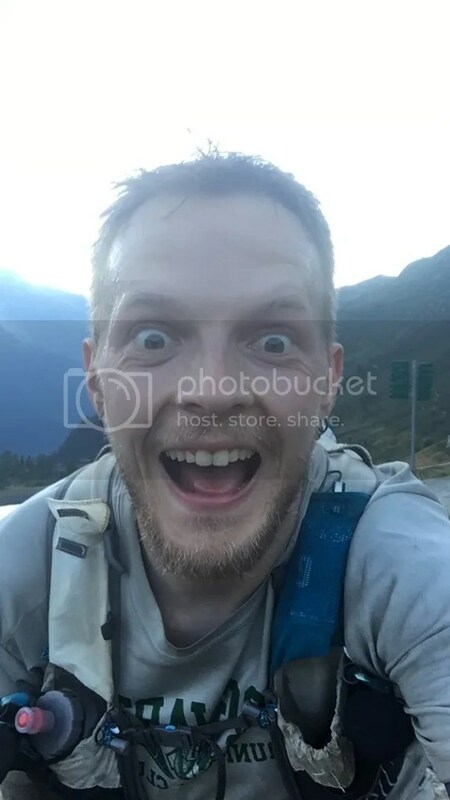 I had been out in the mountains for 20+ hours, through one full night, utterly exhausted a few hours earlier but now I felt fantastic. I pictured all the hardships I had been through and all the support I had received during the race, it was a great feeling! I ran through the checkpoint just stopping for a small cup of coke, taking my GU Root Beer Gel here to give me a final boost to the end. The initial downhill was so damn steep then it went onto a big jeep road for a while you could really get some speed, then into the forests. There was this little river crossing bit and in front of me there were two guys slowly trying to tiptoe across the stones and I just ran straight through it, nearly home now so it didn’t matter about getting the feet wet. 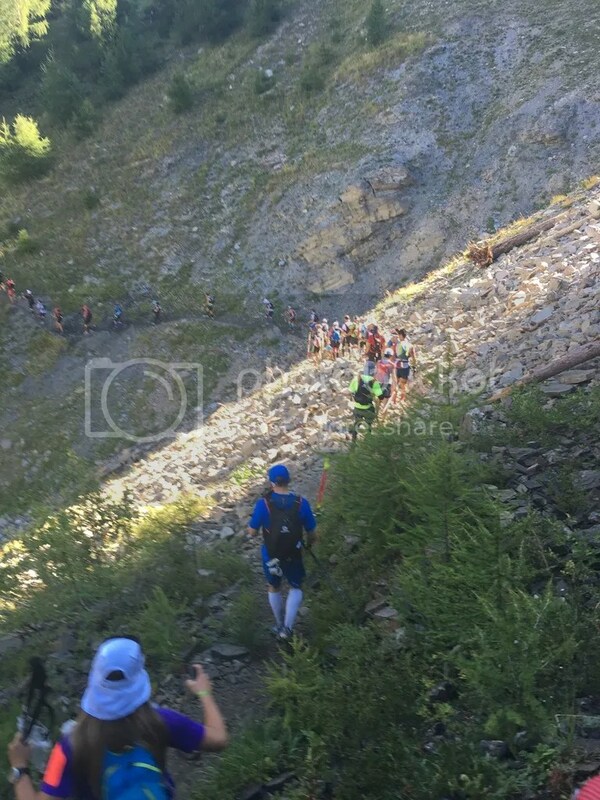 I said well done and Bravo to soooo many runners who looked to be struggling on this final descent and most of them just kind of ignored it which was weird so I just took a gel and put my head down. 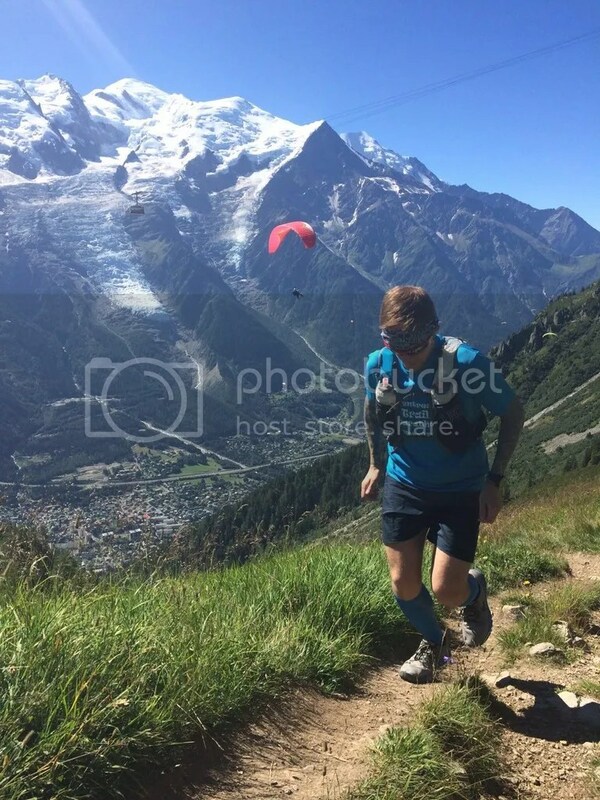 Chamonix was NOT getting any closer, I ran so hard on this descent it was a huge relief to finally hit the outskirts of the town and high five people. Running along the river was magical, knowing it was nearly over! 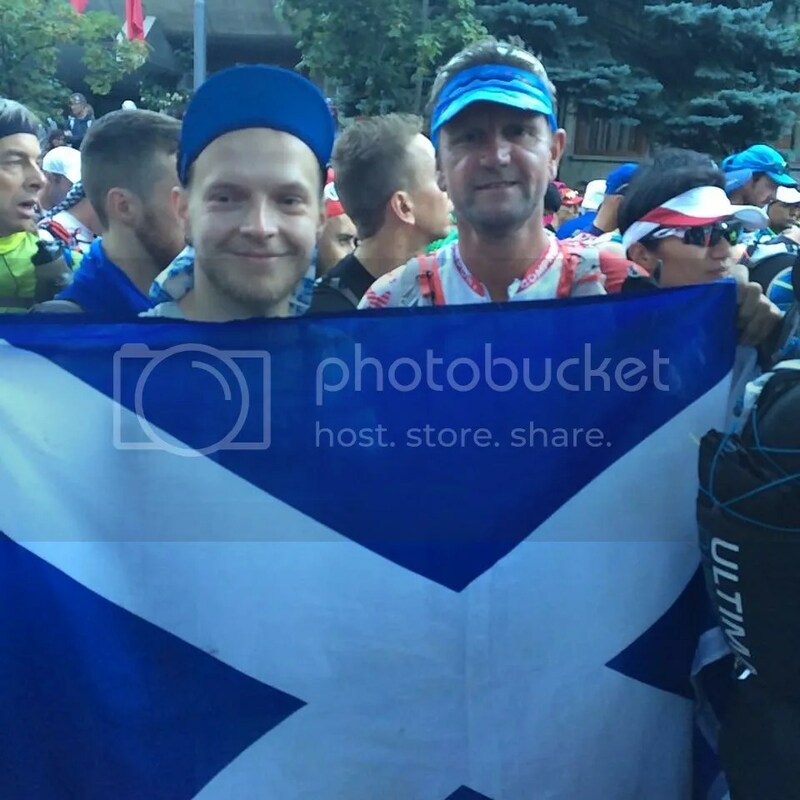 I saw a few Scottish flags in the distance and went charging over to them to see Vicky and a few of the Scottish folk there, I took the flag from John (thank you) and started running with it overhead to the finish around the final bend. Crossing the finish was kind of surreal, I’ve imagined this so much over the past year and couldn’t believe it was now done! Loads of the Scottish guys were there to greet me with Vicky which was lovely. My final time was 22:57:00 so ended up making it under 26 hours and surprisingly under 23 which I didn’t think would happen 10 minutes before that haha. 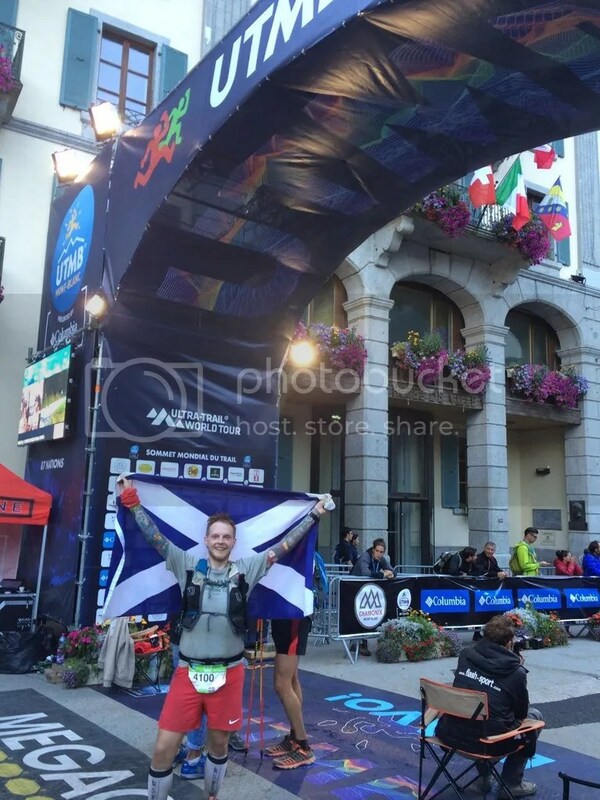 After the finish I picked up the gilet, chatted to Vicky then went to see Alan come in which was a great moment too! 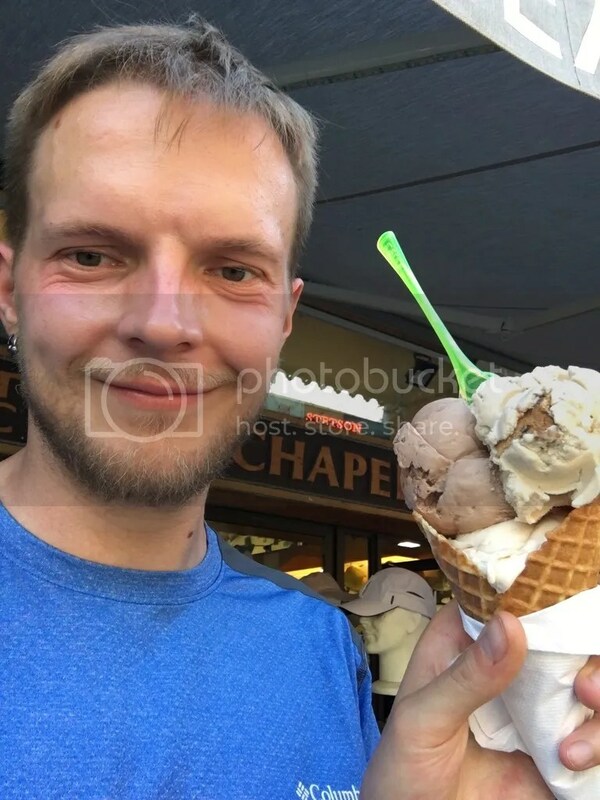 Got some nice ice cream then headed back for a shower. On Sunday morning we met up with a friend we met earlier in the trip who was also running the CCC to see how he got on. 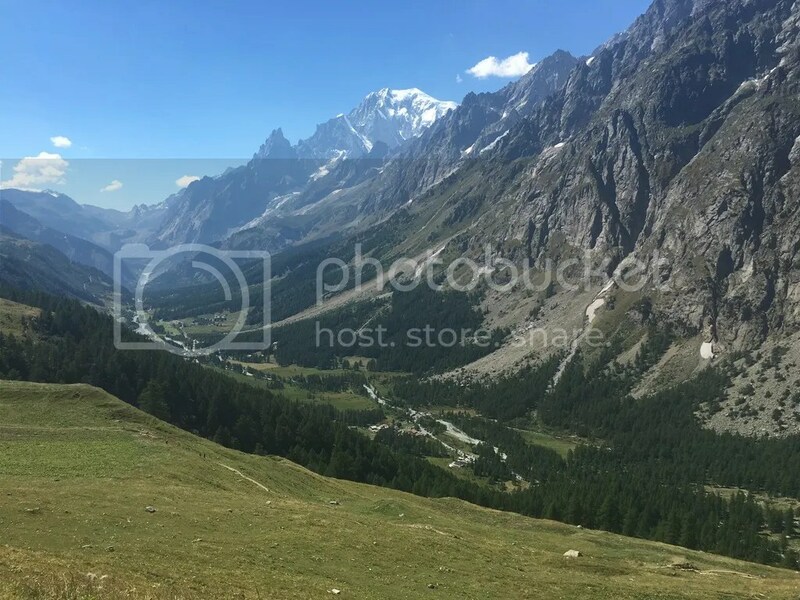 After a little rest we headed back out to see the UTMB finishers in, before spending our final evening at our friends parents Chalet in Passey, the next town on. 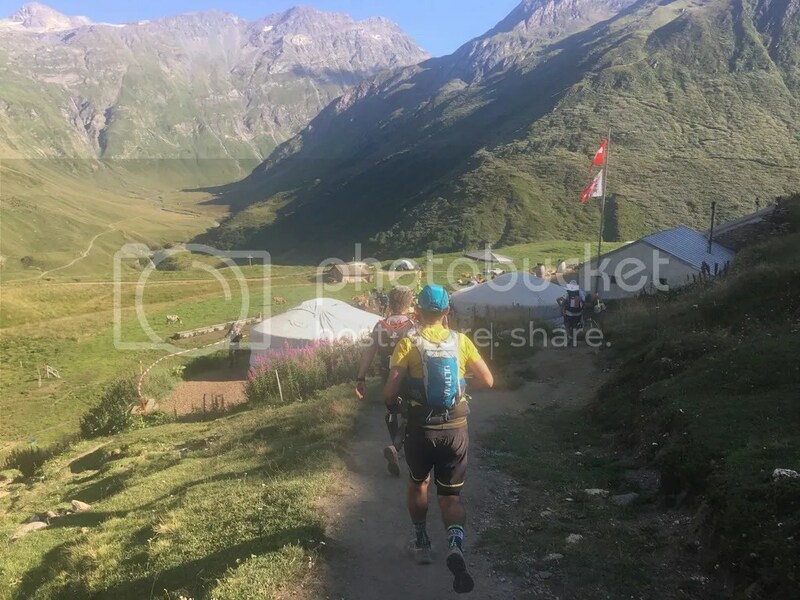 I said to a few people after the race I would never put in for the UTMB, there was something about how tough the 62 mile route was, I doubt I can ever achieve another 40 miles on top of that and do it all in 46 hours…. 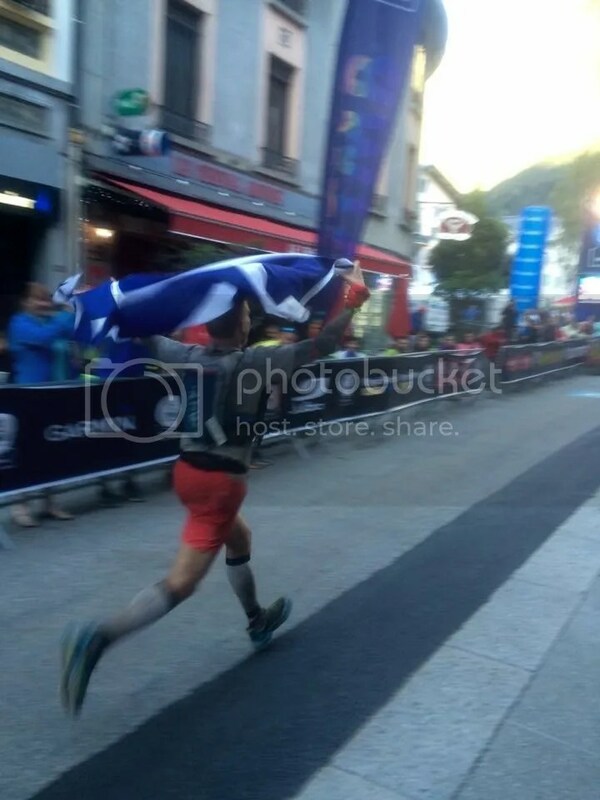 But something about seeing the FINAL UTMB finishers it really hit home, it was so emotional seeing them come into the finish before the cut off, after the thunder and lightning the night before – Utterly broken! 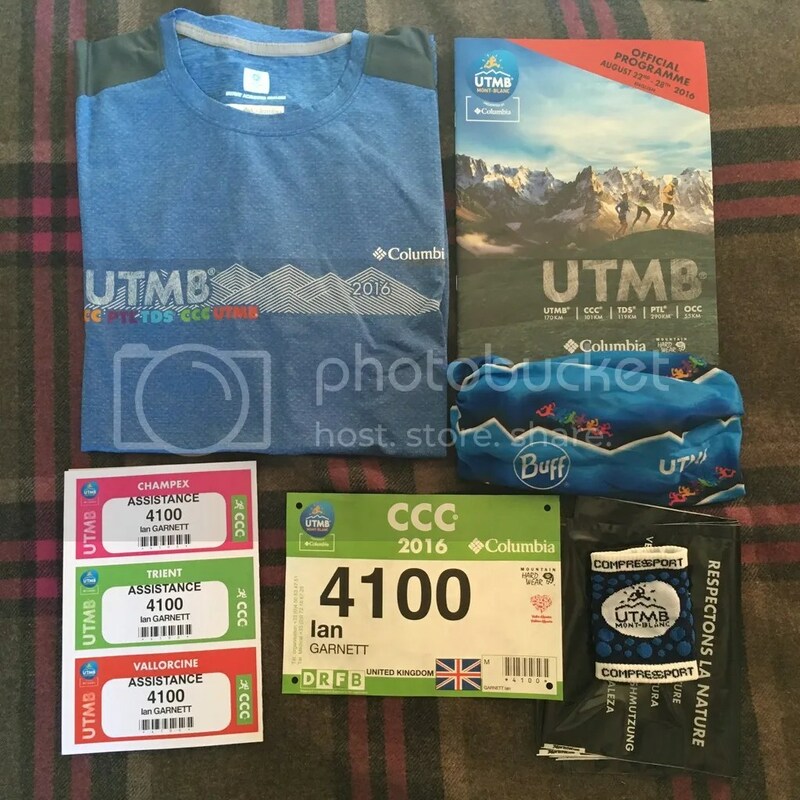 In 2017 I am putting in for UTMB – If I don’t get in that is totally fine and will try again in the future, already got plans lined up for 2017 so it would suit if UTMB didn’t get drawn, but I will do the UTMB one day! 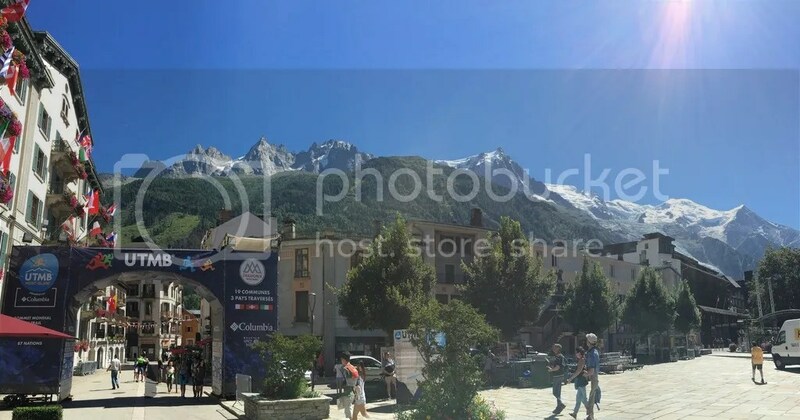 The race atmosphere was excellent, the organisation was excellent, the food and drink were top notch, the villages and surrounding areas were stunning, the hotel was rubbish, Chamonix is super expensive, the mountains are spectacular and made up for everything! Ultimate Direction Anton Pack 3.0 – Pretty good but not without its flaws. The stitching has come loose on the side zip pocket so only really useful for things like nutrition now. The pole holder ripped but luckily I had a hair bobble during the race I could use to hold them in place. Nike shorts – Fantastic and light. 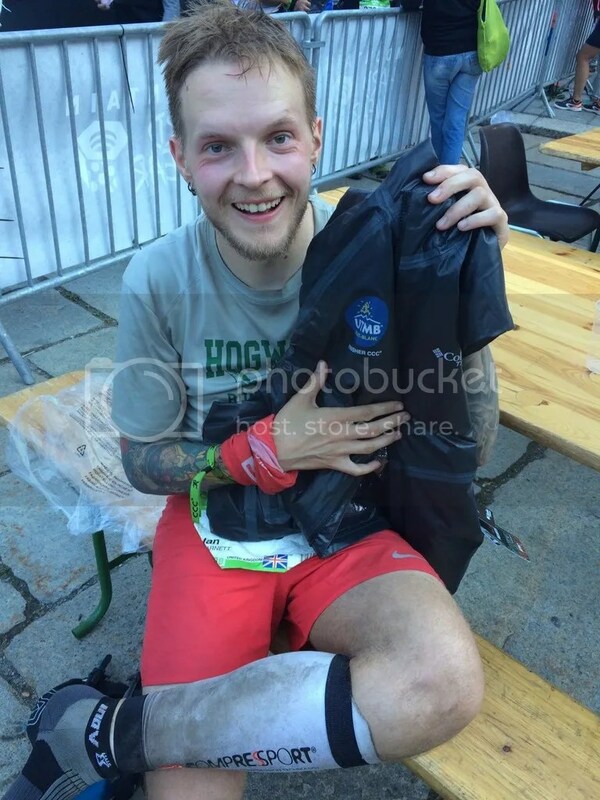 Hogwarts Running Club T shirt – Gotta have some fun, it’s not all serious business! 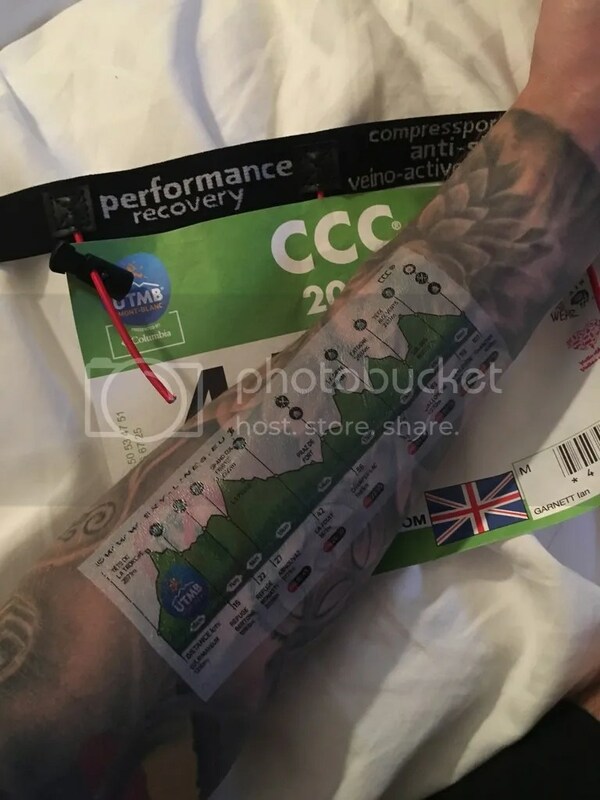 Compressport White calf sleeves – Great for reflecting the sun, protecting my legs from getting burnt and keeping everything tight and secure. Injinji socks – Fantastic but did change halfway through due to rubbing. Inov8 Race Ultra 290 – Fantastic shoes, love these. Dynafit ‘React’ Cap & Buff combo – Breathable, lightweight and great for dipping in streams to cool down. Quest Bars – Best nutrition ever and delicious flavours that kept me happy all the time when I wasn’t in checkpoints. 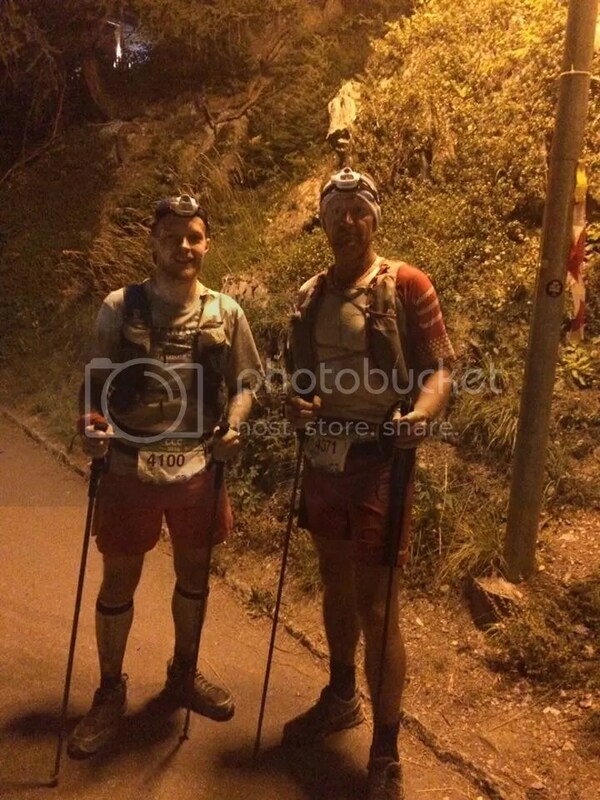 Petzl Nao – Great headtorch lasted the full night on the medium reflective setting, and still had two thirds of a charge left after the race.